Google just announced the entire lineup of Nexus products that we were expecting to see today in NYC. Since that event was cancelled, they went ahead and pushed it all out without an event. So what do we have? Well, the Nexus 10 is super high-resolution tablet that we were expecting. It’s priced at $399 (16GB) and $499 (32GB). The Nexus 7 is now available as a 32GB for $249. But more importantly, there is a 32GB version available with 3G for $299. Along with the new Nexus 4, all devices will be available on November 13. Nexus 4 is our latest smartphone, developed together with LG. It has a quad-core processor which means it’s super fast, a crisp 4.7″ (320 ppi) display that’s perfect for looking at photos and watching YouTube, and with wireless charging you just set the phone down on a charging surface to power it up, no wires needed. While Nexus 4 is incredibly powerful under the hood, it also features the latest version of Jelly Bean, Android 4.2—the simplest and smartest version of Android yet. Starting with the camera, we’ve reinvented the photo experience with Photo Sphere, which lets you capture images that are literally larger than life. Snap shots up, down and in every direction to create stunning 360-degree immersive experiences that you can share on Google+ with friends and family—or you can add your Photo Sphere to Google Maps for the world to see. Android 4.2 brings other great goodies like Gesture Typing, which lets you glide your finger over the letters you want to type on the keyboard—it makes typing fast, fun and a whole lot simpler. Android 4.2 also adds support for Miracast wireless displays so you can watch movies, YouTube videos, and play games right on your HDTV wirelessly. Learn more about Android 4.2, Jelly Bean, here. 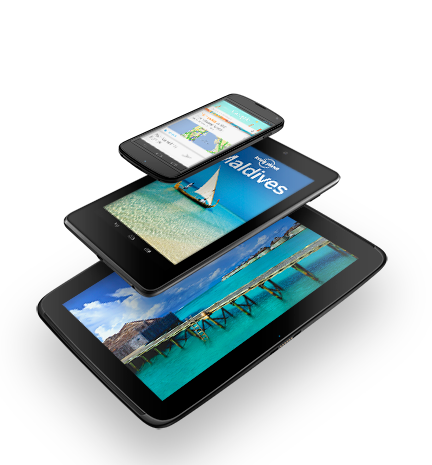 Nexus 10 is the ultimate tablet for watching movies or reading magazines. We wanted to build a premium entertainment device, so we partnered with Samsung to do just that. Nexus 10 is the highest resolution tablet on the planet at 2560-by-1600 (300ppi), that’s over 4 million pixels right in your hands. It comes with a powerful battery that will get you up to nine hours of video playback and more than 500 hours of standby time. With a set of front-facing stereo speakers, you can watch movies right from your Nexus 10 and they simply sound awesome. But what makes Nexus 10 unique is that it’s the first truly shareable tablet. With Android 4.2, you can add multiple users and switch between them instantly right from the lockscreen. We believe that everyone should have quick and easy access to their own stuff — email, apps, bookmarks, and more. That way, everyone can have their own home screens, their own music, and even their own high scores. We’ve recently added a ton of great new entertainment to Google Play, such as movies and TV shows from Twentieth Century Fox. Earlier this year we expanded our service beyond movie rentals and now you can purchase movies and build a library of your favorites in Google Play. Today we’re bringing movie purchasing to more countries – Canada, the U.K., France, Spain and Australia. On November 13, we’re bringing music on Google Play to Europe. Those of you in the U.K, France, Germany, Italy and Spain will be able to purchase music from the Google Play store and add up to 20,000 songs—for free—from your existing collection to the cloud for streaming to your Android devices or web browser. We’re also launching our new matching feature to streamline the process of uploading your personal music to Google Play. We’ll scan your music collection and any song we match against the Google Play catalog will be automatically added to your online library without needing to upload it, saving you time. This will be available in Europe at launch on November 13 and is coming to the U.S. soon after. This will all be for free—free storage of your music, free matching, free syncing across your devices and free listening. A Nexus device is much more than simply a phone or tablet. It’s your connection to the best of Google—all of your stuff and entertainment, everywhere you go with no hassle. Now you have three new Nexus devices, a new improved version of Jelly Bean and more entertainment than ever before—all available in Google Play. The playground is open.